According to the American Heart Association, about 4.9 million Americans are living with congestive heart failure. Of these, 2.5 million are males and 2.4 million are females. Ten of every 1,000 people over age 65 have this condition. There are about 400,000 new cases each year. Heart failure happens when a disease affects the heart's ability to deliver enough blood to the body's tissues. Often, a person with heart failure may have a buildup of fluid in the tissues, called edema. Heart failure with this kind of fluid buildup is called congestive heart failure. Where edema occurs in the body depends on the part of the heart that is affected by heart failure. Heart failure caused by abnormality of the lower left chamber of the heart (left ventricle) means that the left ventricle cannot pump blood out to the body as fast as it returns from the lungs. Because blood cannot get back to the heart, it begins to back up in the blood vessels of the lungs. Some of the fluid in the blood is forced into the breathing space of the lungs, causing pulmonary edema. A person with pulmonary edema has shortness of breath, which may be acute, severe and life threatening. A person with congestive heart failure feels tired because not enough blood circulates to supply the body's tissues with the oxygen and nutrients they need. Abnormalities of the heart structure and rhythm also can be responsible for left ventricular congestive heart failure. In right-sided heart failure, the lower right chamber of the heart (right ventricle) cannot pump blood to the lungs as fast as it returns from the body through the veins. Blood then engorges the right side of the heart and the veins. Fluid backed up in the veins is forced out into the tissues, causing swelling (edema), usually in the feet and legs. Congestive heart failure of the right ventricle often is caused by abnormalities of the heart valves and lung disorders. When the heart cannot pump enough blood, it tries to make up for this by becoming larger. By becoming enlarged (hypertrophic) the ventricle can contract more strongly and pump more blood. When this happens, the heart chamber becomes larger and the muscle in the heart wall becomes thicker. The heart also compensates by pumping more often to improve blood output and circulation. The kidneys try to compensate for a failing heart by retaining more salt and water to increase the volume of blood. This extra fluid also can cause edema. Eventually, as the condition worsens over time these measures are not enough to keep the heart pumping enough blood needed by the body. Kidneys often weaken under these circumstances, further aggravating the situation and making therapy more difficult. For most people, heart failure is a chronic disease with no cure. However, it can be managed and treated with medicines and changes in diet, exercise, and life-style habits. Heart transplantation is considered in some cases. The most common cause of heart failure is coronary artery disease. In coronary artery disease, the arteries supplying blood to the heart become narrowed or blocked. When blood flow to an area of the heart is completely blocked, the person has a heart attack. Some heart attacks go unrecognized. The heart muscle suffers damage when its blood supply is reduced or blocked. If the damage affects the heart's ability to pump blood, heart failure develops. Cardiomyopathy is a general term for disease of the heart muscle. Cardiomyopathy may be caused by coronary artery disease and various other heart problems. Sometimes the cause of cardiomyopathy cannot be found. In these cases the heart muscle disease is called idiopathic cardiomyopathy. Whatever the cause, cardiomyopathy can weaken the heart, leading to heart failure. High blood pressure is another common cause of heart failure. High blood pressure makes the heart work harder to pump blood. After a while, the heart cannot keep up and the symptoms of heart failure develop. Defects of the heart valves, congenital heart diseases, alcoholism, and drug abuse cause damage to the heart that can all lead to heart failure. A person with left-sided heart failure may have shortness of breath and coughing caused by the fluid buildup in the lungs. Pulmonary edema may cause the person to cough up bubbly phlegm that contains blood. With right-sided heart failure, fluid build-up in the veins and body tissues causes swelling in the feet, legs, and abdomen. When body tissues, such as organs and muscles, do not receive enough oxygen and nutrients they cannot function as well, leading to tiredness and dizziness. A person's symptoms can provide important clues to the presence of heart failure. Shortness of breath while engaging in activities and episodes of shortness of breath that wake a person from sleep are classic symptoms of heart failure. During the physical examination, the physician listens to the heart and lungs with a stethoscope for telltale signs of heart failure. Irregular heart sounds, "gallops," a rapid heart rate, and murmurs of the heart valves may be heard. If there is fluid in the lungs a crackling sound may be heard. Rapid breathing or other changes in breathing may also be present. Patients with heart failure also may have a rapid pulse. By pressing on the abdomen, the physician can feel if the liver is enlarged. The skin of the fingers and toes may have a bluish tint and feel cool if not enough oxygen is reaching them. A chest x ray can show if there is fluid in the lungs and if the heart is enlarged. Abnormalities of heart valves and other structures also may be seen on chest x ray. An electrocardiogram gives information on the heart rhythm and the size of the heart. It can show if the heart chamber is enlarged and if there is damage to the heart muscle from blocked arteries. Besides chest x ray, other imaging tests may help make a diagnosis. Echocardiography uses sound waves to make images of the heart. These images can show if the heart wall or chambers are enlarged and if there are any abnormalities of the heart valves. An echocardiogram also can be used to find out how much blood the heart is pumping. It determines the amount of blood in the ventricle (ventricular volume) and the amount of blood the ventricle pumps each time it beats (called the ejection fraction). A healthy heart pumps at least one-half the amount of blood in the left ventricle with each heartbeat. Radionuclide ventriculography also measures the ejection fraction by imaging with very low doses of an injected radioactive substance as it travels through the heart. A new test that measures the level of a particular hormone in the blood was introduced in 2003 and researchers said the test may be useful for testing for heart failure in physicians' offices because it could provide results in 15 minutes. Cardiac catheterization involves using a small tube (catheter) that is inserted through a blood vessel into the heart. It is used to measure pressure in the heart and the amount of blood pumped by the heart. This test can help find abnormalities of the coronary arteries, heart valves, and heart muscle, and other blood vessels. Combined with echocardiography and other tests, cardiac catheterization can help find the cause of heart failure. It is not always necessary, however. Heart failure usually is treated with lifestyle changes and medicines. Sometimes surgery is needed to correct abnormalities of the heart or heart valves. Heart transplantation is a last resort to be considered in certain cases. Dietary changes to maintain proper weight and reduce salt intake may be needed. Reducing salt intake helps to lessen swelling in the legs, feet, and abdomen. Appropriate exercise also may be recommended, but it is important that heart failure patients only begin an exercise program with the advice of their doctors. Walking, bicycling, swimming, or low-impact aerobic exercises may be recommended. There are good heart rehabilitation programs at most larger hospitals. Other lifestyle changes that may reduce the symptoms of heart failure include stopping smoking or other tobacco use, eliminating or reducing alcohol consumption, and not using harmful drugs. Diuretics help eliminate excess salt and water from the kidneys by making patients urinate more often. This helps reduce the swelling caused by fluid buildup in the tissues. Digitalis helps the heart muscle to have stronger pumping action. Vasodilators, ACE inhibitors, ARBs, and calcium channel blockers lower blood pressure and expand the blood vessels so blood can move more easily through them. This action makes it easier for the heart to pump blood through the vessels. Cholesterol-lowering drugs called statins can help prevent death from heart failure. A 2003 study showed a 62% drop in mortality rate among patients with severe heart failure who took statin therapy. In 2003, a new noninvasive procedure was being tested for patients with congestive heart failure. Called enhanced external counterpulsation (EECP), it consisted of inflating three sets of pneumatic cuffs attached to the patient's legs. The therapy had positive effects on the blood pressure and reduced frequency of episodes of angina (pain) in a clinical trial by as much as 70%. Surgery is used to correct certain heart conditions that cause heart failure. Congenital heart defects and abnormal heart valves can be repaired with surgery. Blocked coronary arteries usually can be treated with angioplasty or coronary artery bypass surgery. With severe heart failure, the heart muscle may become so damaged that available treatments do not help. Patients with this stage of heart failure are said to have end-stage heart failure. Heart transplant usually is considered for patients with end-stage heart failure when all other treatments have stopped working. Most patients with mild or moderate heart failure can be successfully treated with dietary and exercise programs and the right medications. In fact, in 2003, the American Heart Association said that even those awaiting heart transplants could benefit from exercise. Many people are able to participate in normal daily activities and lead relatively active lives. Patients with severe heart failure may eventually have to consider heart transplantation. Approximately 50% of patients diagnosed with congestive heart failure live for five years with the condition. Women with heart failure usually live longer than men with heart failure. Heart failure usually is caused by the effects of some type of heart disease. The best way to try to prevent heart failure is to eat a healthy diet and get regular exercise, but many causes of heart failure cannot be prevented. People with risk factors for coronary disease (such as high blood pressure and high cholesterol levels) should work closely with their physician to reduce likelihood of heart attack and heart failure. Angioplasty — A technique for treating blocked coronary arteries by inserting a catheter with a tiny balloon at the tip into the artery and inflating it. Angiotensin-converting enzyme (ACE) inhibitor — A drug that relaxes blood vessel walls and lowers blood pressure. Atherosclerosis — Buildup of a fatty substance called a plaque inside blood vessels. Calcium channel blocker — A drug that relaxes blood vessels and lowers blood pressure. Cardiomyopathy — Disease of the heart muscle. Catheter — A thin, hollow tube. Congenital heart defects — Abnormal formation of structures of the heart or of its major blood vessels present at birth. Congestive heart failure — A condition in which the heart cannot pump enough blood to supply the body's tissues with sufficient oxygen and nutrients; back up of blood in vessels and the lungs causes buildup of fluid (congestion) in the tissues. Coronary arteries — Arteries that supply blood to the heart muscle. Coronary artery bypass — Surgical procedure to reroute blood around a blocked coronary artery. Coronary artery disease — Narrowing or blockage of coronary arteries by atherosclerosis. Digitalis — A drug that helps the heart muscle to have stronger pumping action. Diuretic — A type of drug that helps the kidneys eliminate excess salt and water. Ejection fraction — A measure of the portion of blood that is pumped out of a filled ventricle. Heart valves — Valves that regulate blood flow into and out of the heart chambers. Idiopathic cardiomyopathy — Cardiomyopathy without a known cause. Pulmonary edema — Buildup of fluid in the tissue of the lungs. Ventricles — The two lower chambers of the heart. Heart failure sometimes can be avoided by identifying and treating any conditions that might lead to heart disease. These include high blood pressure, alcoholism, and coronary artery disease. Regular blood pressure checks and obtaining immediate medical care for symptoms of coronary artery disease, such as chest pain, will help to get these conditions found and treated early, before they can damage the heart muscle. A 2003 initiative called OPTIMIZE H-F was aimed at preventing severe heart failure and deaths among patients discharge from hospitals. The project created a registry or database of patients with heart failure that could be shared among hospitals. Finally, diagnosing and treating heart failure before the heart becomes severely damaged can improve the prognosis. With proper treatment, many patients may continue to lead active lives for a number of years. "Even Heart Failure Patients Should Exercise." Clinician Reviews April 2003: 50-52. Jancin, Bruce. "Noninvasive Procedure Eyed for Heart Failure: Enhanced External Counterpulsation." Family Practice News June 1, 2003: 12. "New Care Initiative to Improve Outcomes for Heart Failure Patients." Heart Disease Weekly April 20, 2003: 45. "Rapid Congestive Heart Failure Test a Useful Tool in Physician Offices." Heart Disease Weekly June 15, 2003: 19. Zoler, Michael N. "Heart Failure Deaths Plunge with Statins." Internal Medicine News April 15, 2003: 35-41.
inability of the heart to maintain cardiac output sufficient to meet the body's needs; it most often results from myocardial failure affecting the right or left ventricle. backward heart failure a concept of heart failure emphasizing the resultant passive engorgement of the systemic venous system that. congestive heart failure (CHF) that which occurs as a result of impaired pumping capability of the heart that is not keeping up with the metabolic needs of body tissues and organs; it is associated with abnormal retention of water and sodium. It ranges from mild congestion with few symptoms to life-threatening fluid overload and heart failure. Congestive heart failure results in an inadequate supply of blood and oxygen to the body's cells. The decreased cardiac output causes an increase in the blood volume within the vascular system. Congestion within the blood vessels interferes with the movement of body fluids in and out of the various fluid compartments, so that fluid accumulates in the tissue spaces, causing edema. There are three general kinds of pathologic conditions that can bring about congestive heart failure: (1) ventricular failure, in which the contractions of the ventricles become weak and ineffective, as in myocardial ischemia from coronary artery disease; (2) mechanical failure of the ventricles to fill with blood during the diastole phase of the cardiac cycle, which can occur when the mitral valve is narrowed, as in rheumatic mitral stenosis, or when there is an accumulation of fluid within the pericardial sac (cardiac tamponade) pressing against the ventricles, preventing them from accepting a full load of blood; and (3) an overload of blood in the ventricles during the systole phase of the cycle. High blood pressure, aortic stenosis, and aortic regurgitation are some of the conditions that can cause ventricular overload. Compensatory Mechanisms. In an attempt to compensate for inadequate pumping of the heart, the body uses three basic adaptive mechanisms which, though they are effective for a brief period of time, will eventually become insufficient to meet the oxygen needs of the body. These mechanisms are also responsible for many of the symptoms experienced by the patient with congestive heart failure. First, the failing heart attempts to maintain a normal output of blood by enlarging its pumping chambers so that they are capable of holding a greater volume of blood. This increases the amount of blood ejected from the heart, but it also leads to fluid overload within the blood vessels and excessive accumulation of body fluids in all of the fluid compartments. Second, the heart begins to increase its muscle mass in order to strengthen the force of its contractions. This results in ventricular hypertrophy and a need for more oxygen. Eventually, the coronary arteries can no longer meet the oxygen demands of the enlarged myocardium and the patient experiences angina pectoris owing to ischemia. Third, there is a response from the sympathetic nervous system. The involuntary muscle of the heart is regulated by autonomic, or involuntary, innervation. In response to failing contractility of the myocardial cells, the sympathetic nervous system activates adaptive processes that increase the heart rate, redistribute peripheral blood flow, and retain urine. These mechanisms are responsible for the symptoms of diaphoresis, cool skin, tachycardia, cardiac arrhythmias, and oliguria. The combined efforts of these three compensatory mechanisms achieve a fairly normal level of cardiac output for a period of time. During this phase of congestive heart failure, the patient is said to have compensated CHF. When these mechanisms are no longer effective the disease progresses to the final stage of impaired heart function and the patient has decompensated CHF. Clinical Symptoms. Left-sided heart failure produces dyspnea of varying intensity. In the early stages, shortness of breath occurs only when the patient is physically active. Later, as the heart action becomes more seriously impaired, the dyspnea is present even when the patient is resting. In advanced cases, the patient must sit up in order to breathe (orthopnea). Attacks of breathlessness severe enough to wake the patient frequently occur during sleep (paroxysmal nocturnal dyspnea). These attacks usually are accompanied by coughing and wheezing, and the patient seeks relief by sitting upright. Orthopnea and paroxysmal nocturnal dyspnea are related to congestion of the pulmonary blood vessels and edema of the lung tissues. They are aggravated by lying down because in the prone position quantities of blood in the lower extremities move upward into the blood vessels of the lungs. Fluid retention is another common symptom of congestive heart failure. In left-sided failure there is higher than normal pressure of blood in the pulmonary vessels. This increased pressure forces fluid out of the intravascular compartment and into the tissue spaces of the lungs, causing pulmonary edema. Right-sided failure causes congestion in the capillaries of the peripheral circulation and results in edema and congestion of the liver, stomach, legs, and feet, and in the sacral region in bedridden patients. Decreased cardiac output also affects the kidneys by reducing their blood supply, which in turn causes a decrease in the rate of glomerular filtration of plasma from the renal blood vessels into the renal tubules. Sodium and water not excreted in the urine are retained in the vascular system, adding to the blood volume. The diminished blood supply to the kidney also causes it to secrete renin, which indirectly stimulates the secretion of aldosterone from the adrenal gland. Aldosterone in turn acts on the renal tubules, causing them to increase reabsorption of sodium and water, and thus to further increase the volume of body fluids. Treatment. Medical management of congestive heart failure is aimed at improving contractility of the heart, reducing salt and water retention, and providing rest for the heart muscle. Drugs used to accomplish these goals include digitalis glycosides to slow and strengthen the heartbeat, vasodilators such as nitroprusside and phentolamine to reduce resistance to the flow of blood being pumped from the heart, diuretics to assist in the elimination of water and sodium in the urine, and angiotensin converting enzyme inhibitors to reduce blood pressure, inhibit aldosterone release, and reduce peripheral arterial resistance. beta-blockers are an important adjunct in treatment of heart failure, helping to decrease the sympathetic response. Electroconversion of atrial fibrillation enlists the help of the atria to fill the ventricles to maximum capacity. Biventricular pacing or restoration of cardiac synchrony is helpful for patients with interventricular conduction delay and a wide QRS complex. Patient Care. Hospitalized patients with severe congestive heart failure present problems related to their needs for physical and mental rest, adequate aeration of the lungs and oxygenation of the tissues, prevention of circulatory stasis, maintenance of the integrity of the skin, restoration and maintenance of fluid and electrolyte balances, and adequate nutrition. The care plan should include frequent monitoring of the vital signs, intake and output, daily weight, serum electrolyte and blood gas levels, and nutritional intake. Patients are placed on sodium-restricted diets and limited fluid intake; they should have a good understanding of the reason for this before leaving the hospital. They should also have a plan for regular exercise as tolerated. Since it is likely that they will continue taking several kinds of medications after returning home, patients or family members should be taught about the pharmacologic action of each drug, the need for taking it exactly as prescribed, any precautions to be taken, and any untoward reactions that warrant notification of the physician, nurse practitioner, or physician's assistant. Clinical portrait of congestive heart failure. (SOBOE=shortness of breath on exertion) From Jarvis, 1996.
forward heart failure a concept of heart failure emphasizing the inadequacy of cardiac output as the primary cause. high-output heart failure that in which cardiac output remains high, associated with conditions such as hyperthyroidism, anemia, and emphysema. left-sided heart failure (left ventricular heart failure) failure of the left ventricle to maintain a normal output of blood; it does not empty completely and thus cannot accept all the blood returning from the lungs via the pulmonary veins, which become engorged. Fluid seeps out of the veins through the pulmonary capillaries and collects in the interstitial tissue of the lung, causing pulmonary edema that eventually leads to right ventricular heart failure as well. low-output heart failure that in which cardiac output is diminished, associated with cardiovascular diseases such as coronary artery disease, hypertension, and cardiomyopathy. right-sided heart failure (right ventricular heart failure) failure of proper functioning of the right ventricle, with subsequent engorgement of the systemic veins, producing pitting edema, enlargement of the liver, and ascites. 2. resulting clinical syndromes include shortness of breath, pitting or nonpitting edema, enlarged tender liver, engorged neck veins, and pulmonary rales in various combinations. /heart fail·ure/ (hahrt fāl´yer) see under failure. 1. Cessation of normal heart function. 2. A condition marked by congestion in the lungs, shortness of breath, edema in the lower extremities, and enlargement of the liver, caused by the inability of the heart to pump blood at an adequate rate to the peripheral tissues and the lungs. Also called congestive heart failure. a condition in which the heart cannot pump enough blood to meet the metabolic requirements of body tissues. Many of the symptoms associated with heart failure are caused by the dysfunction of organs other than the heart, especially the lungs, kidneys, and liver. Ventricular dysfunction is usually the basic disorder in congestive heart failure. It often triggers compensatory mechanisms that preserve cardiac output but produce symptoms and signs such as dyspnea, orthopnea, rales, and edema. Heart failure is closely associated with many forms of heart disease, most of which initially affect the left side of the heart. Hence, clinicians commonly divide associated heart failure into left-sided heart failure and right-sided heart failure. Peripheral edema is associated with right-sided heart failure, and dyspnea and other respiratory disorders with left-sided heart failure. Heart failure in infants and children is usually the result of congenital heart disease but also may be caused by myocarditis and ectopic tachycardia. Rheumatic mitral disease and aortic valve disease frequently cause congestive heart failure in young adults. Mitral valve disease, especially mitral stenosis, is the most common cause of heart failure in young adults and affects more young women than men. The common causes of heart failure after 40 years of age are coronary atherosclerosis with myocardial infarction, anemia, diastolic hypertension, hypervolemia, valvular heart disease, pulmonary disease, renal disease, and diffuse myocardial disease. Some individuals may suffer heart failure caused by a combination of congenital heart disease and acquired disease. After 50 years of age, a common cause of heart failure, especially in men, is calcific aortic stenosis. Some of the extracardiac signs of heart failure are ascites, bronchial wheezing, hydrothorax, edema, liver enlargement, moist rales, and splenomegaly. Cardiac signs associated with heart failure are abnormalities in the jugular venous pulsation, the carotid pulse, and the apex wave on cardiographic tracings. Treatment for heart failure commonly involves reduction of the heart's workload, administration of drugs such as beta-blockers, digitalis to increase myocardial contractility and cardiac output, salt-restricted diet, diuretics, angiotensin-converting enzymes to decrease afterload, and surgical intervention. Also called cardiac failure. See also compensated heart failure, congestive heart failure. The loss of the heart’s ability to effectively pump blood, which may affect the right, left, or both sides of the heart. With the loss of pumping action on the right side, blood may back up into other areas of the body (e.g., the liver, GI tract, extremities); the heart may be unable to pump blood efficiently to or through the lungs. Abrupt onset of dyspnoea, pulmonary oedema, left-sided heart disease. Hypotension, oliguria, poor peripheral circulation, cold blue extremities. • Cardiogenic—Acute left ventricular disease—e.g., acute myocardial infarction. • Peripheral—e.g., blood loss, gram-negative septicaemia. Dyspnoea, poor exercise tolerance, peripheral oedema, two-pillow sleeping, chronic lung disease. Pulmonary and pedal oedema—sensitive but nonspecific; also, hepatic congestion, bilateral pleural effusions ± ascites, ventricular hypertrophy or dilation, clear history of heart failure or treatment with a diuretic, beta blocker, or ACE inhibitor. Cardiac failure, cardiac insufficiency, congestive heart failure Cardiology The loss of the heart's ability to effectively pump blood, which may affect the right, left, or both sides of the heart; with the loss of pumping action on the right side, blood may back up into other areas of the body–eg, the liver, GI tract, extremities; the heart may be unable to pump blood efficiently to the lungs. See Congestive heart failure, Diastolic heart failure. 1. Inadequacy of the heart so that as a pump it fails to maintain the circulation of blood, with the result that congestion and edema develop in the tissues. Synonym(s): cardiac insufficiency, congestive heart failure, myocardial insufficiency. 2. Resulting clinical syndromes including shortness of breath, pitting edema, enlarged tender liver, engorged neck veins, and pulmonary rales in various combinations. The condition in which the heart is no longer capable of pumping a sufficient volume of blood to meet the body's needs for oxygen and nutrition. The result is engorgement of the veins and other small blood vessels and fluid accumulation in the tissues (OEDEMA). Failure may affect either side of the heart, or both. In left heart failure most of the effects are apparent in the lungs, in right heart failure most of the effects are in the body generally. Heart failure causes swelling and pitting oedema, accumulation of fluid in the abdominal cavity, breathlessness and moist sounds in the lungs. The commonest cause of heart failure is ischaemia from coronary narrowing or blockage, leading to progressive loss or dysfunction of heart muscle cells. The condition is treated with diuretic drugs to get rid of accumulated fluid, INOTROPIC AGENTS to increase the power of the heart, and drugs of the ACE-inhibitor class to reduce the resistance against which the heart has to pump blood. Angiotensin receptor blocker drugs, aldosterone antagonists, implantable cardioverter defibrillators and left ventricular assist devices may also help to prolong life. The latest advance in heart failure treatment is transplantation of genetically-altered cardiac fibroblasts combined with stem-cell mobilization by granulocyte COLONY STIMULATING FACTOR. See also DIASTOLIC HEART FAILURE. the condition when the heart's ability to pump blood around the body is diminished. Common causes include ischaemic heart disease, hypertension, disorders of the heart muscle or congenital heart disease. Symptoms include breathlessness (especially at night or on exertion) and leg swelling (oedema). Diagnosis is based on the history and clinical examination with additional investigations including a chest X-ray, ECG and echocardiography. Modern drug treatment starts with diuretics and ACE inhibitors. See also angiotensin, cardiomyopathy, coronary artery disease. 2. Resulting clinical syndromes including shortness of breath, pitting edema, enlarged tender liver, and pulmonary rales in various combinations. n a sudden, sometimes fatal, cessation of the heart's action. n a rapid and marked impairment of the cardiac output. n a type of congestive heart failure in which the initiating factor is increased venous pressure resulting from ventricular failure to empty the atria. n a clinical syndrome resulting from chronic cardiac decompensation associated with left-sided or right-sided heart failure. Left-sided failure may result from rheumatic mitral valvular disease, aortic valvular disease, systemic hypertension, or arteriosclerotic disease. Manifestations include orthopnea, paroxysmal dyspnea, pulmonary edema, cough, and cardiac asthma. Right-sided failure results most commonly from pulmonary congestion and hypertension associated with left-sided failure but may result from anemia, myocarditis, beriberi, or dysrhythmia. Manifestations include peripheral pitting edema, ascites, cyanosis, oliguria, and hydrothorax. n a type of heart failure initiated by decreased cardiac output that leads to de-creased blood supply to tissues, decreased excretion of salt (Na1) and salt retention, elevated venous pressure, and edema. inability of the heart to maintain a circulation sufficient to meet the body's needs; most often applied to myocardial failure affecting the right or left ventricle. sudden cardiac arrest such as occurs in anesthetic death and cardiac myopathy of various kinds. It causes death by acute anoxia of tissues especially brain. 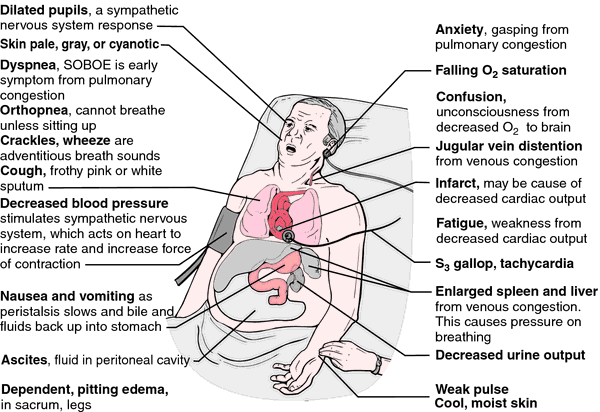 The clinical syndrome varies between a brief convulsion and the development of pulmonary edema. a concept of heart failure emphasizing the contribution of passive engorgement of the systemic venous system as a cause. that which occurs as a result of impaired pumping capability of the heart and is associated with abnormal retention of water and sodium. The condition ranges from mild congestion with few symptoms to life-threatening fluid overload and total heart failure. CHF results in an inadequate supply of blood and oxygen to the body's cells. The decreased cardiac output causes an increase in the blood volume within the vascular system. Congestion within the blood vessels interferes with the movement of body fluids in and out of the various fluid compartments, and they accumulate in the tissue spaces, causing edema. There are three general kinds of pathological conditions that can bring about CHF: (1) ventricular failure, in which the contractions of the ventricles become weak and ineffective, as in myocardial ischemia from coronary artery disease; (2) mechanical failure of the ventricles to fill with blood during the diastole phase of the cardiac cycle, which can occur when the mitral valve is narrowed or when there is an accumulation of fluid within the pericardial sac (cardiac tamponade) pressing against the ventricles, preventing them from accepting a full load of blood; and (3) an overload of blood in the ventricles during the systole phase of the cycle. High blood pressure, aortic stenosis and aortic valvular regurgitation are some of the conditions that can cause ventricular overload. see congestive heart failure (above). a concept of heart failure emphasizing the inadequacy of cardiac output as the primary cause and considering venous distention to be secondary. that in which cardiac output remains high, associated with anemia, emphysema, etc. failure of the left ventricle to maintain a normal output of blood. Since the left ventricle does not empty completely, it cannot accept blood returning from the lungs via the pulmonary veins. The pulmonary veins become engorged and fluid seeps out through the veins and collects in the pleural cavity. Pulmonary edema and pleural effusion result. In many cases heart failure begins on the left side and eventually involves both sides of the heart. that in which cardiac output is diminished, associated with cardiovascular diseases. failure of proper functioning of the right ventricle, with subsequent engorgement of the systemic veins, producing pitting edema, enlargement of the liver, and ascites. There are many treatments available for heart failure that are very effective at reducing symptoms and delaying the progression of the condition. Abraham, MD, director of heart failure and cardiac transplantation at the University of Cincinnati College of Medicine and a member of the steering committee. To test the theory that TNF plays a central role in congestive heart failure, Brett Giroir and Debora Bryant of the University of Texas Southwestern Medical Center in Dallas and their colleagues studied 30 mice that had been genetically engineered to make extra TNF in their heart tissues. Between 2 to 3 million Americans have heart failure, and 400,000 new cases are diagnosed each year. We were pleased to participate in this demonstration and are proud that our performance was rated the best in heart failure management. Paul Hauptman, Director of Heart Failure, Saint Louis University Hospital, St. Researchers found that key biomarkers of heart failure increased in animal hearts with induced heart damage, but decreased in animals whose damaged hearts were supported with the MYO-VAD. Heart failure is particularly common in elderly patients and becomes dramatically more prevalent in the population as people reach the age of 65 and beyond. In hospitals across the nation, treating fluid overload in heart failure patients is costly and outcomes often fall short of physician expectations and patient needs," said John Erb, CEO of CHF Solutions. OTCBB: VASO), a leader in noninvasive management of cardiovascular diseases, announced today three presentations highlighting the benefits of EECP(R) therapy in patients with heart failure were made at the 10th Annual Heart Failure Society of America Scientific (HFSA) Meeting held in Seattle, Washington, September 10-13. NEW YORK -- Daxor Corporation (AMEX:DXR), a medical instrumentation and biotechnology company, today announced significant results from blood volume data utilizing Daxor's BVA-100 was reported at the Heart Failure Society of America's (HFSA) Annual Scientific Meeting held last week in Seattle, WA. NASDAQ:NTMD) announced today that five poster presentations highlighting new findings related to BiDil(R) (isosorbide dinitrate/hydralazine hydrochloride) will be presented at the 10th Annual Meeting of the Heart Failure Society of America (HFSA), being held at the Washington State Convention & Trade Center in Seattle, from September 10 - 13th.